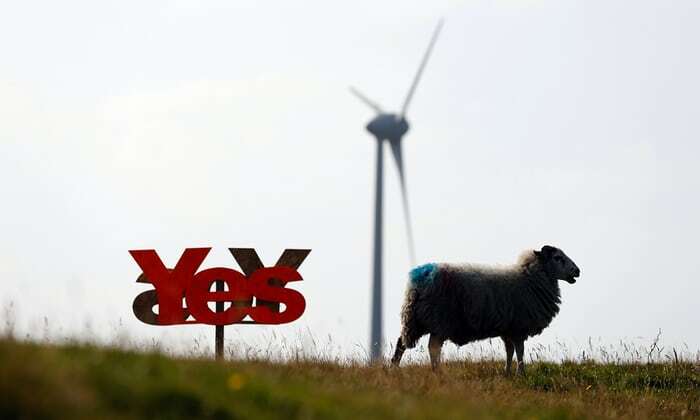 Katie Laing explores the fight for the right to community renewables on the island of Lewis. On one hand is a system that brings direct community control and builds a local economy, on the other one that extracts profit. control and resource from the islands. 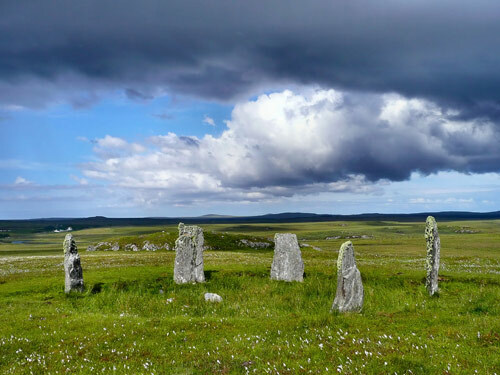 I live on the Isle of Lewis and have been blogging on my site, hebrideswriter.com, for about 18 months about a ‘David and Goliath’ style fight for the right to develop renewables on the island. That fight involves EDF Energy, the hugely powerful French multinational, pushing ahead with what amounts to a modern-day land grab. EDF is the main partner in Lewis Wind Power, and is currently involved in a case in the Scottish Land Court where they are trying to gain their last vital piece of permission to develop the 36-turbine Stornoway Wind Farm. They are also behind the plans for Uisenis, bringing their total ambition for Lewis to 81 turbines. Another corporate, Forsa Energy, want to develop 14 turbines in Tolsta in the north of the island. The problem — and it is a big problem indeed — for EDF in particular is that there is a group of crofters who want to do it themselves and they have a successful model to follow: that of Point and Sandwick Trust, who developed the award-winning Beinn Ghrideag wind farm just outside Stornoway and which makes about £900,000 profit a year, all of which goes to the community. The difference between these schemes, depending on whether they are community-owned or corporate, is absolutely massive. Before we even get into the issues of self-determination, confidence and autonomy, the figures speak for themselves. Point and Sandwick Trust’s scheme is only three turbines — 9MW — but it makes the same profit a year as the amount that EDF have proposed to give back to the community in their ‘community benefit’ pot if they are successful in developing their scheme. Difference is, EDF’s wind farm would have more than 10 times the number of turbines. It is now the stuff of legend that the Stornoway Trust gave away a lease to the ground to EDF without consulting the crofters. Crofting law is complicated and I won’t go into it but the crofters — those who have shares in the common grazings within the Stornoway Trust estate — should have been consulted because the ground in question is common grazings land. That has caused no end of problems because some of these crofters have their own plans for renewables and submitted an application to the Crofting Commission around 18 months ago, under a piece of the Crofting Act known as Section 50B. They want to develop 21 turbines, all of them on the same spots as some of EDF’s 36 for Stornoway. That submission has still not been dealt with but was overtaken by another piece of legal action under the Crofting Act — this time a Section 19A application from Lewis Wind Power, which went to the Scottish Land Court in the summer. What is notable about the Section 19A application is that it asks for a development to be approved even when the crofters oppose it — so it is hostile. It harks back to the Clearances, for some, with this element of disinheritance. The big difficulty in Lewis is that the Lewis Wind Power plans are being backed by the local authority, Comhairle nan Eilean Siar, as being ‘the only game in town’, in terms of securing the interconnector cable which is needed for any future developments to go ahead. The current cable is at capacity. This issue is making the national news now and the council is really not liking the scrutiny. In fact, they put out a letter this morning about it. That letter then claimed that “the only way” a renewables industry could emerge in the Outer Hebrides would be if Lewis Wind Power and Forsa Energy were successful at the Contracts for Difference auction in 2019. Many folk dispute that as community groups now have a track record of delivering these kinds of projects. The council’s letter also claimed that LWP and Forsa were the only parties with all the consents needed to participate in the CfD auction — but that is disputed too, as they do not yet have their Section 19A approvals yet and it’s by no means guaranteed that they will get them. Even if LWP and Forsa were successful in the Contract for Difference auction — the complicated subsidy system which supports renewable energy developments by guaranteeing the price they will get for their electricity from government (it’s called an auction because companies put in what price per MW they say they can develop for) — they still could not build without the Section19A permission from the Scottish Land Court. The statement from the council does show you, though, just how much they are backing this multinational horse. It follows another council statement a few weeks ago that they were looking to set up a ‘joint vehicle’ with Stornoway Trust so that, together, they could buy minority shares in the LWP schemes. The Trust are pursuing 20 per cent in the Stornoway Wind Farm and the council 30 per cent in Uisenis – but there are so many questions around this. These shares would cost in the region of £100million and who are they going to find to lend them that kind of money for a minority share in a project which they cannot control? It’s all to do with this big push for the interconnector cable, which will cost hundreds of millions and will only be built if there are enough Megawatts guaranteed to use it (so that the cost of investment can be recovered). However, there is no reason why community groups can’t be part of this. National Grid are not allowed to show a preference between community or corporate schemes and it is silly to suggest that EDF will pull out of Lewis entirely if the fight over the 21 turbines does not go their way. That could still leave them with 60 approved turbines, which would be incredibly valuable. Even if they chose not to develop themselves, someone would. They are not going to pull out in a huff and threaten the interconnector because crofters thumbed their nose at them. Even if they didn’t want to develop, they would sell the rights — and that’s quite possible, actually, as they have a history of selling wind farms, selling five in England late last year and several a number of years ago to the Chinese — their partners in Hinkley Point C, of course. So if it’s the interconnector people want, EDF do not have to get every single one of their 81 turbines for it to happen. And if we must have this large-scale development, then surely it has to be worth our while? It has to be worth more than crumbs from the table, bowing and scraping all the way. Admittedly, there is some suspicion about what community groups would do with all this money if they were successful. In fact, the crofters have already signed up to the same policy as Point and Sandwick Trust, which would be to use the net profit from the wind farm to benefit the whole of Outer Hebrides, not just their own immediate area. It is a policy that is already making a big difference in the islands, with many organisations receiving cash including the local care home and hospice, which receives £55,000 every year, and the arts centre, which gets £20,000. If ‘interconnector-scale’ development is to go ahead, but the community groups don’t have a place at the table (with the proper recompense), then I think the interconnector ceases to be a great idea. That’s because of the amount of land that would be covered by these turbines — industrialisation, arguably — and because there would be precious little land left available for communities to develop for themselves, as so much is protected by wildlife designations. One friend told me recently that Lewis needed “vision and patience” where renewables was concerned. Vision in terns of recognising what the community was capable of. And patience because renewables technologies were still unfolding. Soon, we may not even need an interconnector to be able to find an outlet for our power. I don’t mean an alternative mains network — it’s too big an island for that — but in terms of transportation possibilities. Across the world, there is cutting-edge research into electric vehicles, batteries, grids and even planes. And there is hydrogen too — with Point and Sandwick Trust at the centre of an announcement just last week, that the Scottish government had funded them for a feasibility study with partners including Ferguson Marine, CMAL and Siemens into developing a hydrogen-powered ferry service for the Hebrides. None of that would need an interconnector because none of that has a ‘route to market’ problem. Before long, we will be amazed at what is possible. Let’s not give away all that potential too hastily. And let’s remember that we are custodians. The essence of this article is that the “interconnector” – the idea of a hugely costly cable to carry power to the mainland – is both a corporate scale of a “solution” and a retrograde, 20th century solution. The quantity and size of wind turbines that it would necessitate would ruin the scenic beauty of significant parts of the island and, by walking roughshod over local crofters (farmers) wishes, it would disempower the very communities it is supposed to help. The solution, the 21st century solution, is a renewables-based locally managed network, like they have on Eigg but for a community of 20,000 rather than 100. It would mean capitalising on the rapidly unfolding EV (electric vehicle) technologies so that batteries in cars, buses, etc are used both for power and smart storage. It might mean developing pumped storage on the island, where water is pumped up to high lochs from low ones on windy days, and released in calm weather. It would mean hydrogen technologies such as were featured for shipping in last week’s Stornoway Gazette. Above all, it would mean community empowerment, rather than a dispiriting unearned dole trickled down from mega corporations. I’m all for renewable energies, but in a way and at a scale that’s with communities, and fitting to the scale of the environment, and not against them. For the Western Isles, that means YES to local-scale ways forward, but NO CORPORATE INTERCONNECTOR. That nuance accurately reflects what I have seen of the community. They are engaged in a process of informing themselves and looking at all sides of the arguments. I witnessed it when back home on the island in August, and (not at my own instigation) was taken by the former MP to a meeting with the clerks of the common grazings. Excellent, particulary the alternatives to the interconnector to harness the energy for transportation. I’m beginning to get weary of correcting the fake news that Point & Sandwick and their paid PR person Katie Laing keep pumping out. What Katie and her employers frequently fail to mention is that both the transmission and distribution networks on the island are full – this means that no other grid connections are allowed – so no other community projects will be able to be built – not if they want to make money selling the energy they generate anyway. And whilst Alastair is correct that moving towards a more sustainable decentralised energy grid is a brilliant idea it is not one that will happen quickly – indeed the hydrogen ferry project that has caused so much excitement is not, as people may have assumed from some of the hyperbole, a contract to build a hydrogen ferry, no it is the establishment of a study to determine whether or not a blue water hydrogen ferry is even feasible – so again not something that is going to happen any time soon. The simple fact of the matter is that for any communities to build renewable generation an interconnector. The only way an interconnector will get built any time soon is if we have enough fully consented developments with grid connections that can successfully bid in the upcoming CfD auction – again the simple fact is that only the two developers mentioned have the necessary consents and vonnection offers in place. Whilst some of the community plans may receive planning consent in time for the auction they are unlikely to get a grid connection because our network is full and will stay so until we get an interconnector. As for community schemes not being part of the interconnector – as Katie and her employers have been told repeatedly – the corporate schemes will not take up the full 600MW of the interconnector there will be over a 100MW of capacity for future community projects – capacity that the local council managed to get added into the needs case by SSE. No this is not David versus Goliath at all. This is more the Wizard of Oz. This is about politics and some people wanting to have all the power and resenting the fact that people are starting to see the truth past their smokescreens and curtains. 100% spot on, Eddie, and high time someone called them out on their blatant lies. Eddie – you seem to gloss over the fact that if the proposed EDF/Wood project goes ahead the communities in question will have no land available to them to build turbines. The lease of this land was signed with no consultation with the affected crofters, yes, I’ve heard the bluster about the Stornoway Trust have documented evidence, but, as yet this has not been made available. For the avoidance of any doubt, EDF/Wood do not have the necessary consent, they are currently locked in a Land Court battle with 250 objectors who are not going away any time soon despite the best efforts of EDF/Wood, Stornoway Trust and CNES. I haven’t glossed over anything as there is still plenty of land about. As for the oft-repeated claim that there was no consultation – I’m happy to let documentary evidence make a lie of that. As for the latest untruth that you and your employees – assuming you are the Rhoda Mackenzie that is one of the directors of PSDT – as you have been told repeatedly, including in a full council seminar where your own chairman did not raise any objections, the section 19a application has no bearing on the eligibility to partake in the CfD auction – it requires planning consent which LWP and Forsa have as well as a confirmed grid connection consent which again LWP and Forsa have. None of the proposed community windfarms that you guys keep claiming will be able to compete in the CfD are likely to gain grid consents as, again as you have repeatedly been told, the distribution and transmission network is full and thus closed to new connections – until we get a new interconnector – which needs these corporate schemes to go through. Do I wish we could do it with 100% community owned schemes? Absolutely. But given the facts as they are that isn’t possible any time soon – regardless of how much we wish it were different. Do I also wish the whole electricity system/market was run in a more sustainable way – again absolutely. But that will take time – time that an interconnector will give us – time to become an exemplar for decentralised energy generation and use – but it all hinges on getting the interconnector in place first. Is Katie Laing a ‘paid PR person’? It does look as if she is, according to the ‘Work with me’ page on her blog. I do hope Bella has not been taken in by a piece of ‘astroturfing’ (fake grass roots). “I work as a freelance writer, journalist and PR consultant, specialising in promoting all kinds of organisations, from community trusts to global brands, by helping them to tell their stories. My list of PR clients past and present includes Acair Books, Point and Sandwick Trust, Stòrlann Nàiseanta na Gàidhlig, Stornoway Port Authority, Sandwick Bay Candles, An Lanntair and Harris Tweed Hebrides. I was also Communications Manager for NHS Western Isles from 2015 to 2016, covering a maternity leave. I can produce written content for websites and social media platforms, as well as traditional press articles. I also provide advice on reputation management. She is absolutely a paid PR person, Alisdair. A mere puppet for PST. I don’t think Katie has ever hidden in any way her work for Point and Sandwick Trust. But she’s also an award-winning journalist and a blogger with independent views. The story stands up to any scrutiny and I’d suggest you address her arguments and the facts and issues at play rather than an ad hominem attack on the author. Her story doesn’t stand up to scrutiny as my previous comments have demonstrated. Comments in which I addressed her arguments quite happily. I have no problem with Katie working for PSDT and I think she does a wonderful job of raising their profile. Equally I think PSDT dod a wonderful job getting their windfarm built and they do brilliant work around the islands. That however does not give them licence to go around peddling untruths because they don’t like that they aren’t in control. It would have been helpful if it had been made clear in the introduction to Katie’s post on Bella that she has been paid by the Point and Sandwick Trust to ‘manage their public relations’. I have been blogging for 13 years but have never been paid by anyone. When I first read the post I assumed Katie was expressing her views as an ordinary member of the local community. I did not think I was reading something written by a ‘blogger for hire’. Is this story anything more than upmarket ‘churnalism’? It is a question of trust. I have always trusted Bella, but now there is an element of doubt. I don’t imagine that EDF are in the right, but it would have been a stronger story if it had been written by a more independent source. Interesting case, but my understanding is that the Stornoway Trust is itself a community body. So two communities occupying the same land, but with different democratic takes on its best use. Crofting law is famously complex, but if the crofters are tenants, rather than owner-occupiers, can’t they exercise their right to buy, including the common grazings, either as individuals or as a crofting community? The interconnector argument seems at least as complicated. The Beinn Ghrideag scheme seems to have gone forward as a contribution to the local grid, but that is now at capacity? So future viability will depend on the interconnector. There is no way the crofters’ case threatens the interconnector. It is sheer corporate greed on EDF’s part to be pushing so hard for 100 per cent of these turbines. They could have conceded the 21 to the crofters, who are quite capable of delivering these projects, and that would still have left them with 60. That would be plenty to be getting on with, I’d have thought, and would mean no change in the total number of guaranteed megawatts in the game to secure the interconnector. It is the refusal on the part of this French multinational to compromise with the community groups that is arguably threatening the interconnector. They have tied themselves in knots in the Scottish Land Court and, if they were really smart in wanting to get all this sorted before the CfD auction, they’d be trying to do a deal with the crofters so that everyone could get past the legal actions and get their ducks in a row quickly in time for the auction next year. Sticking with the interconnector point, a lot is made of the fact that there will still be capacity for community groups to develop their own but there are no worked-up proposals for any more community turbines on Lewis at the moment, other than the ones being pursued by the four crofting townships under the Section 50B application. Also, it has been suggested that we are unlikely to see any such plans due to the large tracts of land in Lewis that is covered by bird designations, etc. If there was all this potential land for development, why would Forsa Energy’s plans for the 14 turbines at Tolsta be in breach of the planners’ buffer zone, coming within 2km of houses? There must be a reason they didn’t shift the development further out into the moor, away from the houses. Yes, there is a lack of transmission capacity. I have mentioned that often in my pieces on this and it is widely known and recognised. That point is not in dispute or glossed over. As the editor says, I have never hidden the fact I do PR work for Point and Sandwick Trust. But I also work as a journalist (currently with the Stornoway Gazette) and as a blogger. All opinions are 100 per cent my own. So that readers are not misled, it might be helpful for Eddie Hallahan to explain his own connection to EDF? I struggle to understand how anyone who could possibly believe in a new Scotland, one with autonomy, could find it acceptable for a French multinational to come in and try to take away the crofters’ rights to their land without their consent – which the Section 19A unarguably does. Lol – my ‘connection’ to EDF is that I did a student summer placement with Lewis Wind Power in 2014 whilst doing my energy engineering degree. During this time I was paid by AMEC as EDF were only just getting involved with LWP and I spent the two months interviewing local companies with regard to their capabilities. Since then I haven’t talked to anyone from EDF as far as I am aware. So not much of a connection at all really – certainly just as strong as the fact that in the course of my degree one of the PSDT directors was one of my lecturers and made extensive use of your windfarm in our lectures as well as multiple visits to the site. I’ve also visited various of the power stations on the island and as such I’ve got connections to SSE as well in your view I suppose. So Katie, unlike yourself, I am not being paid to promote this ‘story’ in any way shape or form. No the reason I have felt compelled to get involved is because I along with many others have got fedup with the way PSDT is trying to throw their weight around by telling basic untruths. EDF are not the ones being corporate bullies – that would be PSDT. Perhaps the best evidence of this bullying is the fact that PSDT have not paid their community landlord the rent they are due – rent that would be shared out between the various crofting townships – so they obviously don’t care that much about the other crofters. So now that I’ve dealt with the personal attack I shall move on to the ‘substantive’ part of your arguments, although calling them arguments may be a bit of a stretch. What is happening with the ‘community proposals’ is that once LWP had invested millions in environmental surveys, wind surveys, consultations etc and had a well developed plan in place some crofting townships decided they could just put turbines where LWP wanted to put them and that would save them having to do most of the work. LWP are more than happy to compromise with community groups – helping them wind data, survey data etc if they are asked as far as I am aware – what they don’t seem willing to do is give in to flat-out attempts to blackmail them, and nor should they in my opinion. There is plenty of suitable land within the Stornoway Trust area-the community landlord who any of the crofters you mention are entitled to stand for election as trustees of – an election is taking place just now I believe. The same community landlord that PSDT aren’t paying their rent to. The Trust is more than happy to help any of the townships develop their own schemes as well I believe – just not on land that is already being developed by someone else. So your claims that if the townships don’t get to use the turbine sites that LWP have identified they don’t get to build any turbines is basically a lie. Now onto the land court stuff. Firstly a Section 19a application is a standard part of a windfarm development, so contrary to all the wild claims being flung about it is not anyone running scared etc. It also, as has been repeatedly stated to you and your employers, does not affect their eligibility to compete in the CfD. What does affect the eligibility to compete in the CfD is whether the development has planning consent – which both LWP and Forsa have – and none of your townships have at the moment, though they should have by CfD time. It also requires a grid connection consent however which, again as you and your employers have been told repeatedly, LWP and Forsa have and none of the townships have yet. Now here is the point you keep glossing over and trying to fudge away – none of the townships will get grid connection constraints in time for the CfD. Why? Because both the transmission and distribution networks are full therefore closed to further grid connections until the interconnector is put in place. Even if LWP turned round today and said the townships could develop on the turbine sites they are wanting to pike it wouldn’t change the grid connection issue because LWP would still retain their 180MW connection and the townships would have to apply for one -which they wouldn’t get because the grid is full. There is plenty of scope for community turbines all over the islands what is stopping the development of community turbines is the fact that the grid is full, which will only change if we get the interconnector in place. The reason the Forsa application is within the 2km zone is partly because the zone has changed since they started the planning process. There are other reasons set out in the various planning documents availanle online. I know your story plays much better if you can frame it as plucky crofters fighting a foreign corporate giant – sort of the whole us against the incomers thing. Thankfully, that just isn’t the case. LWP have already agreed 20% of the stornoway wind farm can be community owned and 30% of the uisenis one. Which despite all the rhetoric to the contrary are offers capable of being taken up. Would I prefer that both windgarms could be 100% community owned? Absolutely – but that isn’t reality at the moment. I would much rather we get the interconnector in place as soon as possible to enable more community development than put off the interconnector in order to pursue some mythical shangri-la as punted by PSDT – who don’t mind if an interconnector happens or not as they are already set. A bird in the hand is worth two in the bush as they say. Equally 20% of something is something – 100% of nothing is nothing. A minor correction to my above post – I typed rent where I should have typed community benefit (this being the amount per MW per annum) that PSDT are legally obliged to pay to their community landlord. Eddie – you and I have never met but as it appears from your confusion between ‘rent’ and ‘benefit’ (which no phone would ever conflate) you are deriving your information from a source in EDF/the Stornoway Trust, can I invite you down to the Point Community shop to also meet with the Point and Sandwick Trust? We have tea and cakes and we would love to show you round. First, I am indeed the Rhoda who was recently elected a director of the Point and Sandwick Trust (PST). That does not make PST my “employer”. On the contrary, like all the directors I am unpaid and the reason I volunteered to stand is because PST is the most dynamic and exciting community organisation in the Western Isles today. We derive all our income from the community wind farm, the largest in the UK, which we built in 2015. 100% of the profit from this 9MW scheme is donated to PST. The net income this year is circa £900,000. This is the same amount that EDF are offering in community benefit from their 180 MW despite the fact it is 20 times larger. Second, contrary to your assertions, our money is used to help community projects that benefit the whole of the Western Isles, not just in Point and Sandwick. That unselfish wider commitment is built into the PST constitution and is one of the main reasons I joined PST. Third, as regards your rent/benefit confusion, you have been misinformed by your source. In fact, we pay more rent pro rata per MW than any other wind farm on the Stornoway Trust estate. Moreover, we are the only wind farm to agree to make an additional payment on top of this rent to support good causes in the Stornoway Trust estate area. (The Stornoway Trust has exempted the nearby privately-owned Pentland Wind Farm from paying anything though it is twice as large as ours – perhaps you can ask your source to explain why). And far from refusing to pay this additional amount, we have been urging the Stornoway Trust for the last 12 months to agree some suitable projects to receive the £80,000 that we have set aside specifically for this purpose. I fear that the problem is that some in the Stornoway Trust think the money is for them per se rather than for good causes in the community. This is a misconception that we are doing our best to clarify. Turning to the other “blatant untruths” which you say that PST is guilty of peddling, you are incorrect to say that the four community projects cannot participate in the CfD auction next year because the they cannot get grid connection agreements. On the contrary, they have all received grid connection offers from SHEPD. As regards the EDF offer to sell 25% to the Council once the wind farm is built, I am afraid this is a pretty blatant con. There is no bankable legal agreement behind this offer and, in any case, no bank would fund such a purchase when they would have no security over its operation (unlike community-owned wind farms which banks are happy to project-finance). The Stornoway Trust say that they have commissioned a KPMG report (yes, the Carillion auditors) which shows that this offer can be funded – but they refuse to release it to the public. Perhaps you can ask your source for a copy. Finally, you have the history backwards. You say that the Lewis crofters are trying to steal the hard work put in by EDF in getting these sites consented. But the four crofting villages began their project back in 2005 when EDF/LWP had no plans to build turbines in that area. It was only in 2009, after the crofters had their first 3 turbines consented (now the Point and Sandwick wind farm) and EDF/LWP had their large scheme in North Lewis rejected by the Scottish Government, that EDF turned their attention to the Point and Sandwick area. EDF then proceeded to develop their scheme for that area without informing the crofting communities, far less asking for their permission. Thus, the right of precedence belongs to the crofters who first identified their grazings as wind farm sites, secured the first planning consent, and who have been developing their projects ever since. It is EDF who are the hijackers. But the real issue of principle here is not this question of precedence or the other rather small and snarky issues you raise. On this, I speak not as a director of PST but as the spokesperson for Sandwick North St, one of the four crofting villages who are locked in battle with EDF over who has the right to build on our community grazings: the community themselves or a greedy multinational (remember they have 60 other turbines already consented on Lewis on top of the 21 they are trying to force onto our land). Zoom out to the wider picture: 50% of onshore turbines in Denmark are community or locally owned. In Scotland the figure is 60 MW community-owned out of a total of 5,200 MW onshore. That is less than 2%. Community ownership in Scotland has had to fight and struggle every step of the way to assert its right to exist, far less to flourish. We are surrounded by naysayers who say that communities are too small to succeed and that we should step aside and let the big boys do it (which is the total sum of your argument). That might be the political and economic orthodoxy but 230 crofters and families in the Isle of Lewis beg to differ and they are taking their argument to the Land Court this summer and, indeed, to the Court of Session if necessary. Our fight in the Isle of Lewis is also Scotland’s fight and that is why the crofters will persist, and why I believe we will win. I never said the phone conflated rent and benefit – that was my doing, what my phone does have is a tiny screen which means I didn’t properly proof read my post, hence all the other errors in spelling, missing words etc. So no great conspiracy or indeed confusion just an honest error on my part, sorry to disappoint. As for my tone – if you can point out the areas where my tone has been intemperate I would appreciate it, otherwise I will just treat this as another attempt to play the man and not the ball. As for you not being an employee of PSDT – I never said that you were an employee – I said that you were a director and that Katie was one of your employees, which you are and she is. I hope that has helped clear up your confusion on that matter. As for PSDT being “the most dynamic and exciting community organisation in the Western Isles”…well you’re entitled to that opinion, they definitely have the best PR. Also you claim that I have asserted that PSDT only do stuff in point – I’s like you to point these assertions out because if you actually read what I said there are no such assertions – indeed I even credit PSDT with good work around the islands. So once again I am forced to assume that this is yet another attempt to play the man and not the ball – I’m not feeling much temperance here Rhoda. Now I could go through all the other ‘small and snarky issues’ (to borrow a temperate phrase from yourself Rhoda) that you have raised but given your offer to come and have a chat in your office I’ll take you up on that and you can show me the grid connection offers, the paperwork around the community benefit payments etc and if I’m wrong I’ll more than happily say so. I will correct a couple of your later points however. In June 2017 the actual figure for community and locally owned renewable energy was 666MW – well above the Scottish Government target of of 500MW by 202, so much so that they are now aiming for 1GW by 202 and 2GW by 2030 so I definitely do not agree with you that we are surrounded by naysayers saying community energy can’t work – the figures put the lie to that. Equally, as I have stated repeatedly if you actually read what I wrote, I absolutely want to see 100% community owned schemes being developed – nowhere have I stated we should just step aside and let the big boys do it – no, what I am pointing out are the facts of this one particular case where our local grid is full and, due to the horrible way the electricity market is set up, the interconnector we need to free up the islands for renewable energy generation that empowers local communities has to be underwritten by the schemes being developed, and in order to get the critical mass we need to see the interconnector built any time soon, we need these particular corporate schemes to go ahead. So Rhoda – I’m quite happy to come along to PSDT and have you prove me wrong with the evidence of your assertions – are you quite happy to show me that evidence? From a dispassionate observer: an enjoyable and illuminating exchange here, thank you all for keeping it factual and civilised so the rest of us can learn. Does our country as a whole benefit from multi nationals swanning off with our assets? Indeed, although it is worth noting that, unlike oil and gas, the wind is renewable and thus they aren’t taking any of that away – the wind will still be there when they are gone. Equally they aren’t getting ownership of the land – they are simply being given a fixed term lease for a specific development on a very well-defined portion of the land. The land will still be owned by the community landowner. I’m not exactly sure what assets the evil foreigners are supposed to be carting off in this case? I totally agree that as a general principle it would be much better if the revenue generated by renewable energy was able to be reinvested and used by the local communities. I absolutely want to see more 100% community and locally owned energy schemes happening. It is a far more sustainable model, the trouble is that if we tell the corporate developers to go away then there will be no interconnector – which while it may suit some people would mean the death of any new community energy schemes on the island for quite a while. As I have stated repeatedly – it is just that in this particular case no schemes, community owned or not, will go ahead unless we get an interconnector. Well either that or there is a massive advance in energy storage/decentralised grid technologies, which while they are advancing won’t be deployable at any sort of scale any time soon. Would I prefer that the 400 odd MW schemes were 100% community owned? Absolutely, but they aren’t and I would much prefer to see the local communities get 20 or 30% of something rather than 100% of nothing. Eddie, you don’t do olive branches do you, even when garnished with tea and cakes? The offer to come visit the PST office is open where we can show you whatever you want to see of the work of the charity. As regards the four townships grid connections, that is not being done by PST but by the townships themselves. I suggest you contact the Grazings Clerks and get a briefing from them about that and the history of their projects. They are very open to people – but do bring the KPMG report and any evidence of landlord/shareholder consultation in exchange. On your main point, that we need the large corporate wind farms to develop the interconnector, the replacement of 21 out of 95 turbines by community ownership rather than corporate ownership will not harm the interconnector case in any way – if anything it will enhance it in the eyes of the taxpayer and consumer, as it is the latter who will pay for the interconnector in the end. If you and EDF would back the four townships instead of attacking them, the Scottish community-owned total would more than double to 185 MW. I think that would be welcomed by the Scottish Government and should be supported by everybody in Scotland who want to see a fairer country based on stronger communities. Oh dear Rhoda, and it was all going so well. As I’ve repeatedly pointed out I’m not involved with EDF at all, any more than I’m involved with PSDT. I’m simply an informed member of the local island community who is more interested in getting to the facts of the case than in engaging in hyperbole. However it can be seen as a matter of public record that you yourself are one of the main campaigners for one of the townships hence my reason for asking you to show me evidence of your assertions. It is completely my intention to go to the Stornoway Trust and LWP and ask them for evidence of their assertions as well. I do however find it very informative that whilst you will quite happily demand that the SYT and LWP make all their stuff public you are unwilling to do so yourself. As for the rest of your comments they shows a lack of understanding about the energy sector. Firstly the planning and grid consents go on total capacity – not number of turbines – so the LWP consent is gor a 180MW windfarm of **up to** 36 wind turbines – the actual number of turbines that can get placed is generally decided late on in the process and is guided by the available technology. Thus your simplistic analogy doesn’t really work. Secondly, only 24% of Scotland’s energy consumption is electricity whilst 51% is heat so renewable heat actually has a far greater potential impact than simply generating electricity does. This is why an interconnector is so important – because it frees up our local grid to allow the development of more sustainable energy solutions than just putting up turbines to pocket the cash. Thus the reason why I prefer to use the Scottish Government figures for community and locally owned energy which is 666MW currently operational with another 50MW being built. Rather than quibble over which figure you prefer I think it is clear that my main point in quoting the figure – disproving your assertion that everybody was against community energy has been achieved. Thirdly – I would appreciate if you could point out where I have attacked any of the townships. Because as far as I can see reading back over what I have written the only thing I have attacked is hyperbole and unsupported assertions. I can only assume that this is yet another attempt to play the man and not the ball.